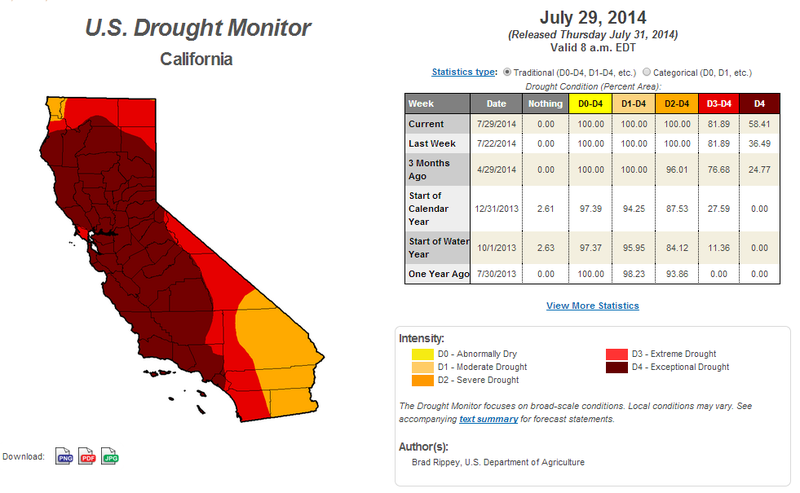 In April, Boxer and Feinstein introduced the California Emergency Drought Relief Act of 2014, which passed the Senate in May and was sent to the House for consideration. Last week, Politico reported that a re-drafted version was sent to House, in the hopes of getting the bill passed the Republican-controlled House. The U.S. Drought Monitor has increased the intensity of drought conditions in some of California; currently more than 58% of the state is now considered to be in exceptional drought, the most severe category, up from 36.5% last week – a significant jump – and 82% is in extreme drought. Governor Brown has issued an emergency proclamation for the state of California due to the effects of wildfires in northern California. Since last week, CAL FIRE has responded to 251 fires that have burned 6,568 acres, bringing the year-to-date totals to 3,813 wildfires on 44,408 acres. On Thursday, the U.S. Bureau of Reclamation issued a “Finding of No Significant Impact” report for a proposal to allow the transfer and sale of 13,000 acre-feet of Merced County groundwater to the Del Puerto Water District and the Patterson Irrigation District over the next two years. Mandatory emergency water use restrictions that were approved by the State Water Resources Control Board on July 15th went into effect July 29th. Some areas are not likely to impose the $500 fine that the legislation allows, while others have implemented smaller fines or are currently discussing alternative enforcement mechanisms. On July 30th, the U.S. Bureau of Reclamation announced that it will not be releasing extra, cool water from Trinity Lake to the Trinity and Klamath rivers for chinook salmon and steelhead. Instead, the Bureau will use the limited supply to prevent large fish kills of endangered species in other runs in the Central Valley. Stanford’s Water in the West program has released a series about groundwater management in California. The series takes an in-depth look at available groundwater data, aquifer recharge, and groundwater conflicts in California. On August 1st,the U.S. Court of Appeals for the Federal Circuit ruled that the U.S. Bureau of Reclamation owes “expectancy” damages to the Central San Joaquin Water Conservation District for failure to deliver sufficient water from the New Melones Reservoir. The U.S. Drought Monitor has increased the intensity of drought conditions in some of California; currently more than 58% of the state is now considered to be in exceptional drought, up from 36.5% last week. 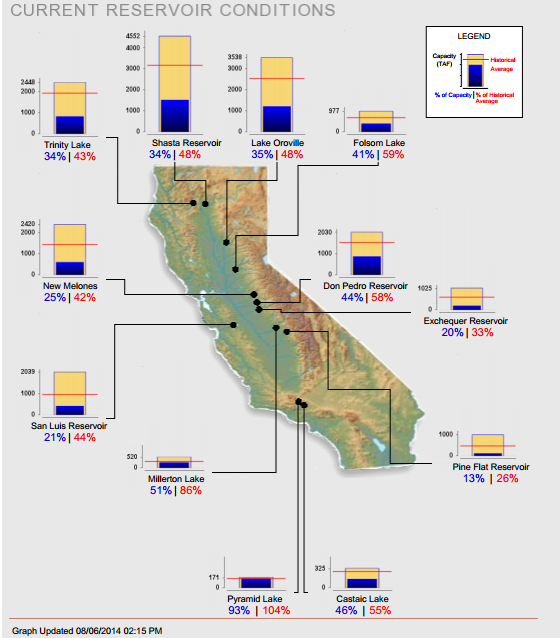 Statewide, California’s major reservoirs (representing nearly 27.2 million acre-feet of storage), are at about 36% of total capacity and 53% of normal. 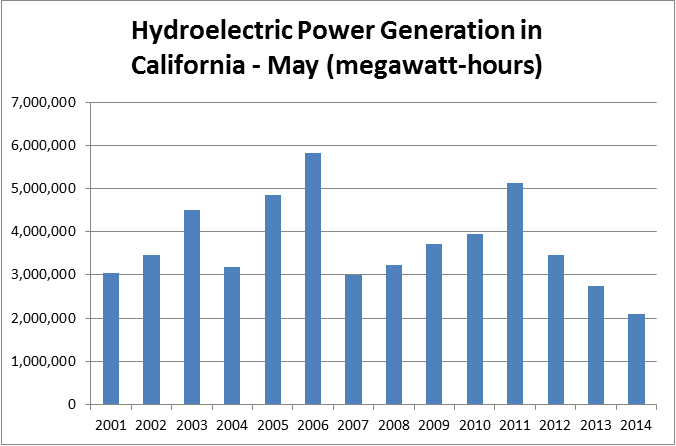 Hydroelectric power generation in May was 2.1 million megawatt-hours (MWh). 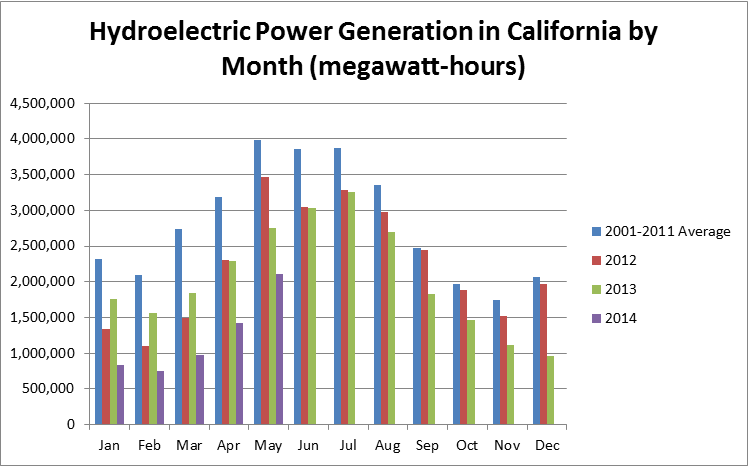 From 2001 through 2013, the average generation in May was 3.8 million MWh.